An Honest to Gosh 100% True Fish Story starring me and my friend Vicky, with special guest appearance by Myrrhlyn the Dog, on a beautiful day in Jamaica Bay and Queens. Click here to view the photos! It was SO nice to get out on the water on Saturday when I really hadn't planned to, and it was absolutely gorgeous out. Here are a dozen photos from our spin around Canarsie Pol. The moon was out, looking as though it was snared in a net of clouds, and Derek got my attention as we passed the daymark in time for me to spot the osprey he'd noticed there - my first of the season! Click on any photo for a better view (slide show unfortunately doesn't seem to be working right now). As I'd mentioned in the last post, I'd made a decision to garden rather than paddle. That was a bit of a tough call - if you've been reading this blog for very long, you'll know that I really like traditions like New Year's Day paddles and Escapes from Black Friday (by land or by sea, either one's a million zillion times better than shopping), and the Opening Day paddle is definitely one of those. However, I'd actually gotten out both of the weekends before that, one very short one before the kayak committee potluck on the 7th, and then a 14 mile solo which was my first ever attempt at finding a whale in my kayak. More on that in a trip report later. I didn't find the whale but the long paddle was very satisfying, just what I'd been aching for for weeks, so I wasn't feeling quite as much like I NEEDED to paddle as I sometimes do this time of year. Saturday was just a perfect day for gardening, and we're getting to the time of year when I really like to get the garden going, so that's what I ended up doing, and that was satisfying too. Anyways, there were plenty of other boats out on the water, nobody organized a paddle but some independent paddlers went out, the CCNY Concrete Canoe Team was practicing sprints near the dock (they look good this year! ), and some of the sailors went out. While all of these other things were going on, some club members under the direction of Jim L. (who's both a sailing committee co-chair and the head of the boatbuilding group) went next door to the Diamond Point Yacht Club to put the club's Point Comfort 23 safety boat, Canarsian, back in the water for the season. After the potluck and general meeting, I was sitting with Barbara, our relatively new membership chair, as she signed up some new members who'd joined us. Sebago's modernized enough that there are now administrative things that can be done on tablets on site, instead of people filling out paper forms and somebody then needing to type all of their info into the club database. Barbara hadn't used the tablet for sign-in before, and although I couldn't really offer to help I did offer to sit with her and offer moral support. Well, that lasted until somebody came through saying that Patrick was taking Canarsian out for a spin. Boat ride? Out on the water for opening day after all? Heck yeah! Poor Barbara, so much for moral support from me, I was up and grabbing a PFD off the clubhouse rack with apologies, but without a moment's hesitation. But because rides on Canarsian are generally being given on open house type days, when I'm making myself useful helping out with kayak or war canoe trips for our guests, this was my first time seeing Canarsian from HERE! A fantastic finish to Opening Day! I sure hope so! Feeling cautiously optimistic that Spring might finally be here in earnest after that crazy yo-yo start the season had here in the Northeast, I decided to break with tradition today. It was opening day at Sebago, and that usually means a pre-potluck paddle, but nobody really instigated anything. I could easily have taken on the instigator role myself (and I felt a little guilty that I didn't), but it just seemed like today would be a very convenient day to get my garden plot at the club ready to go for the season. My first stop of the day in Canarsie was therefore at Dragonetti's Florist and Garden Center, over on the other side of the Paerdegat Basin, to pick up some compost; I walked that over to the club on a luggage cart. How's that for urban gardening for you? I used to clear out the bed in the fall, at the end of the growing season, but a couple of years ago some of my ecologically-minded friends were sharing an article recommending leaving things more or less alone until spring, to provide shelter for beneficial insects like native bees and ladybugs and food for birds. It made enough sense that I've now adopted that practice for my garden. So the above is pretty much the shaggy dried remnants of last year's plants. I was so happy to find new growth on the lavender, thyme, and rosemary. We had some harsh weather and also some very up-and-down swings this winter, and although all of these had made it through last winter, they were looking pretty dry the last time I'd looked at them. I was afraid it had all been too much for them, but look at the fresh new growth here on the lavender! Thyme and rosemary are also coming back. Compost added, onions and daffodils thinned, and that was it for today - by now the meeting had started, I'd just wanted to finish this up. I forgot to put out the cat discourager sticks, but we don't have as many stray cats as we used to (there used to be a guy that was feeding them in the parking lot of the gym next door, and I think that the gym got new owners a few years back, and they may have asked the guy to cease and desist) so I'll keep my fingers crossed that this doesn't get used as a litter box. I actually got seeds during one of the snowstorms we had over the winter. I went to the Brooklyn Botanic Garden and they had these pretty seed packets on display in their gift shop. I just couldn't resist making a nod to warmer weather there in the middle of the snow. I was going to plant the beets and chard today but there was suddenly an opportunity to go out for a boat ride so I did that instead - so even though I wasn't expecting to, I still got to get out on the water on Opening Day. And here's the first garden-aided dish of the year - onion soup with the thinned onions, plus white wine and some broth I'd made a couple of weeks ago. In addition to a dinner tonight, this will make a good lunch or two during the week, which is likely to be hectic . Great start to Earth Day weekend! Early Bird? Nope. On-Time Bird. Late Snow. If you've been reading this blog for a while, or if we're Facebook friends, you've probably seen this guy before. This is The Early Bird, and I was inspired to paint him a few years back when I'd seen my first oystercatcher of the spring a good bit earlier than I ever had before - mid-March or so - and then a couple of days after that, it snowed, and I just couldn't stop thinking of the poor bird out there in the sloppy wet snow, wishing he hadn't been such an early bird. 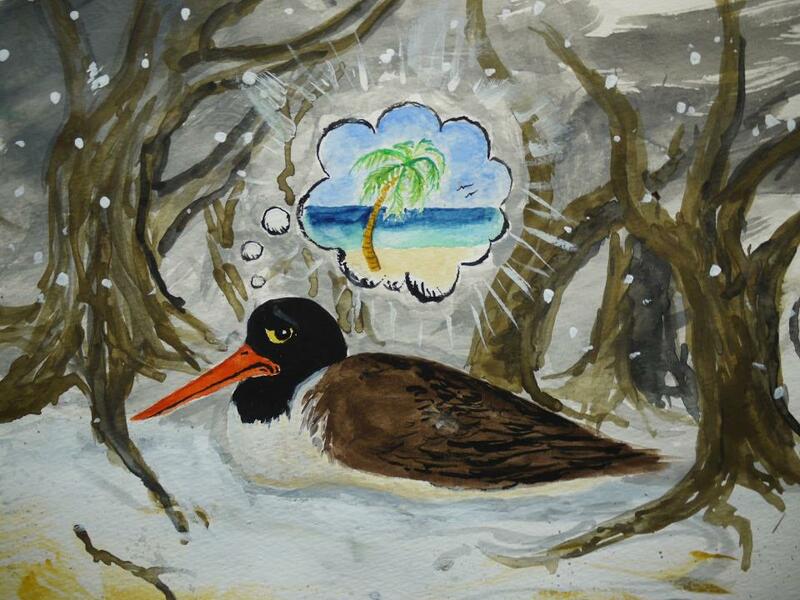 He now reappears on my social media every time I see a spring bird and then it snows. Snow in mid-March isn't that unusual, but this year spring keeps giving us false starts and then winter comes back for another encore, even though the folks in the northeast and midwest are all yelling "GO HOME, WINTER, YOU'RE DRUNK!" 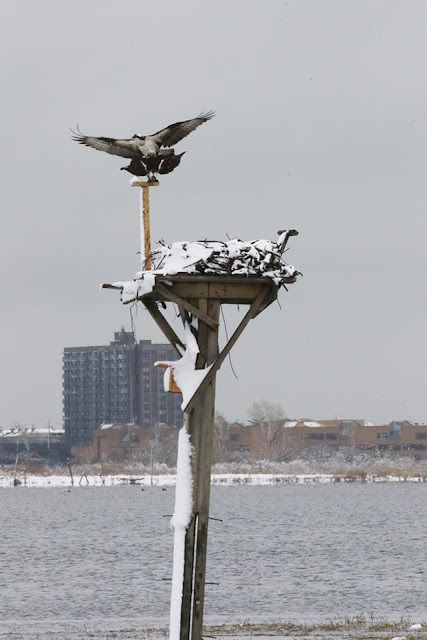 So we had a bit of a snowstorm in early April and our Jamaica Bay Guardian Don Riepe totally outdid my bummed-out oystercatcher with this magnificent photo of an osprey wondering what is this white stuff doing all over the nest. Actually the osprey doesn't look nearly as put out as my oystercatcher does, but seriously, this poor guy just flew a very long way starting from someplace warm and sunny only to be greeted with a snowstorm - well, wild animals are tough, but I still can't help feeling a little sorry for them when this happens! Click here to read a great NY Times article about an osprey tracking project that Don was involved in a few years back. They actually had a blog while it was running, and I absolutely loved following the sea eagle's journey from his wintering grounds in South America back to the nest platform in Jamaica Bay. I was so sorry when it ended! Blooming quite beautifully at the Sebago Canoe Club. h/t to Joe at The Horse's Mouth for my stealing of his Friday theme since time immemorial, plus my Hawaiian friend K., whose FB page was where I first saw this and loved it more than I can say. Had to share this for all my mainland friends who are curious about how that neighborhood McPokebowl (possibly spelled with an é) joint stacks up against the real thing. Now you know. Perhaps I owe an apology? Same day as the cherry blossoms, in front of my building. 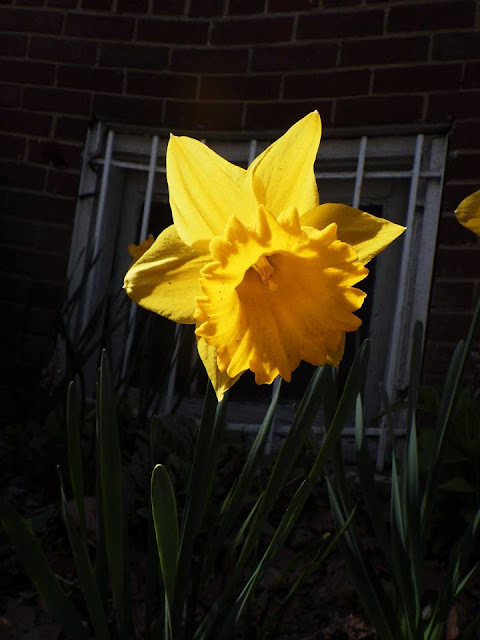 I got home from the club potluck just when this daffodil was still illuminated by the sun but the shadow of the building had fallen on everything behind. I will admit to upping the contrast but not by a whole lot, the daffodil was shining out like neon! American Woodcock in a happier environment. Well, I had a different sort of night on Friday. I worked late wrapping up one of the 7 licensor forecasts that are due next week and was finally on my way home when I found an exhausted woodcock hunkered down in the middle of the sidewalk on Broadway near Canal Street. I watched it for a while and it didn't budge as people walked by. I didn't want to just leave it there, somebody was eventually going to kick the poor thing. I didn't have a towel but I had a plastic bag which I wrapped very loosely around its body, leaving its head sticking out, and then I just picked it up. My first thought had been to walk it over to the Hudson River Park and find it a safer-looking spot in the plantings for it to spend the night, but when it just let me pick it up without any objections at all, settling down in the crook of my arm like a tame pet chicken, I got to thinking maybe I should take it to one of those 24-hour emergency vets and see if they could help it. I haven't got a smartphone but I stopped a couple of young ladies who were passing by and they kindly looked up a vet. The nearest one was at 15th street and 5th avenue, so me and the bird got in a cab and went there. Unfortunately they only take dogs and cats there (she said the only thing they would do with a bird there was euthanize it if it was badly injured, and my little bird didn't have anything obviously wrong with it except for maybe being exhausted). The receptionist was able to give me the name of a 24 hour vet that did take birds up at 62nd street, and also the name of a wild bird rescue that would open at 8 am. Only hitch is that TQ and I had a family gathering in CT in the morning and we were supposed to be up there at 10. I tried to call him to see what he would think of me skipping the gathering and take care of the bird, maybe taking the train up once I'd gotten the bird squared away (his family is all fond of animals so I think that would have been ok), but he must have turned the ringer off to sleep, so no dice. So I left the vet and stopped outside trying to decide whether I wanted to try taking the bird up to 62nd street, or take it home and explain the situation to TQ in the morning, or possibly go back to Plan A and take it to the Hudson River Park and try to find a safe spot in the plantings to tuck it in for the night, leaving it there and hoping for the best. Now, as I'd been carrying it around, it had seemed like it was perking up a little bit, opening its eyes more (lovely dark eyes), picking up its head, and beginning to move a little bit more. I'd been holding it very gently and it really hadn't been trying to get away through any of this. Well, as I was standing there trying to decide what to do the bird took matters into its own hands, suddenly gave a much more energetic wiggle and then jumped right out of my arms and flew away! I wish I'd been able to get it to a park but maybe warming it up helped. I hope it was able to find someplace better than the middle of a sidewalk to spend the rest of the night. BTW I originally posted this on Facebook and specifically shared it with a couple of friends who know a lot more than I do about birds. One of them I would have called for advice before I even picked up the bird except that I lost my cell phone earlier this year and haven't re-built my contact list yet. They agreed that the bird I found had probably flown into a window and stunned itself - this is a big hazard for birds in NYC, and keeping it warm and safe while it recovered turns out to have been the right thing to do. The first to give advice also recommended the Wild Bird Fund (same place as the receptionist at the vet had recommended) as the very best place to take a bird in need of help - click here for a success story involving a woodcock found much the same way I found mine, only a little more banged up so in clearer need of help). She also mentioned that the best way to transport an injured wild bird is in a paper bag, she said they stay calmer that way, which makes a lot of sense. Good to have knowledgeable friends - thanks all!